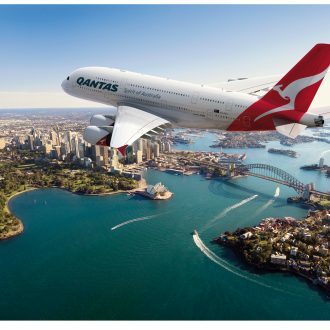 Cabin crew and medics fought valiantly to save the life of a critically ill passenger on a Qantas flight from London via Singapore early this morning. A spokesperson for the Australian airline advised that the cabin crew put out a call on the aircraft pa system asking if there were any doctors on the flight. According to a fellow passenger, two medically trained people made themselves known to the crew, but all their efforts were in vain. “Our crew did everything they could, including helping perform CPR with a doctor who was on board, but unfortunately the passenger has passed away,” the spokesperson told local media. The QF2 (VH-OQC) diverted to Adelaide for the medical emergency and fellow passengers said the crew frantically tried to help the female patient, behind the curtains of one of the aircrafts galleys. Another passenger reported that they could see someone holding up a bag of fluids that were being administered via an IV to the ill passenger through breaks in the curtains. After the aircraft arrived in Adelaide, police boarded the flight, who later issued the following brief statement, “At 3.30am on Friday 29 June, police were advised that a plane bound for Sydney was diverted to Adelaide, following the death of a woman from New South Wales. “Our thoughts are with the passenger’s family,” the Qantas spokesperson said.